I am extremely proud to announce that WAND is now partnering with Informatica. Informatica is a leading provider of Product Information Management and Master Data Management software. WAND's ecommerce taxonomy can be imported into Informatica so that Informatica customers can start with an expert-built product taxonomy with detailed attribute templates. Gartner lists Informatica as a visionary in its magic quadrant of Master Data Management of Product Data Solutions. Forrester identifies Informatica as a leader in its Forrester Wave PIM Report in 2014. To kick-off the partnership, WAND and Informatica will be hosting a joint webinar on February 25, 2015 at 11:00 AM Eastern. "5 Key Elements to a Successful Ecommerce Product Taxonomy"
This is an educational webinar that will go over some of the key considerations that any company should have while undergoing an e-commerce taxonomy project. We'll also show a brief demonstration of the WAND e-commerce Taxonomy within Informatica's PIM. We hope you can join us! This week's question is: "How do you import a taxonomy into the SharePoint term store?" Answer: Taxonomies (or term sets as SharePoint calls them) can easily be imported into SharePoint 2010 or SharePoint 2013 from within the term store. To get the appropriate import format, you can download a sample file directly from SharePoint term store. Once you are in the term store (accessible through Central Administration or through Site Settings), you should first click on the Managed Metadata Service on the left hand panel in the term store. Then, on the right hand panel you will see a link called “View a Sample Import File” where you can download a file that is in the correct format. This file can be edited or used as a model to create your own import format. Once you have your file ready, right click on a term group name and choose "Import Term Set". Navigate to your import file and select it. The Taxonomy will then show up as a term set in the selected term group and will be ready to use. If you are looking for a different example, you can download a free SharePoint Taxonomy from WAND. The WAND General Business Taxonomy has a starter set of terms for HR, Accounting and Finance, Sales and Marketing, IT, and Legal and is downloadable in SharePoint import format. WAND Taxonomies cover a wide variety of industry vertical topics and nearly every business functional area. Each taxonomy can be downloaded in SharePoint term store import format. 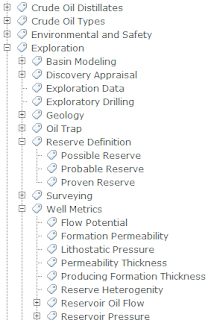 ﻿﻿﻿﻿﻿﻿We are proud to announce the release of our brand new Oil and Gas Taxonomy. 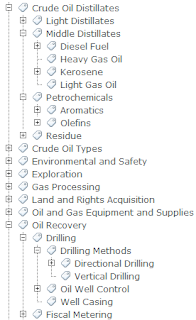 The WAND Oil and Gas Taxonomy contains 1513 terms with 270 synonyms and includes both upsteam and downstream topics for the oil and gas industry including exploration, drilling, petroleum recovery, refining, gas processing, geology, equipment and supplies, environmental, safety, and more. The oil and gas industry has been proactive in implementing ECM solutions; WAND's Oil and Gas Taxonomy is a terrific high quality pre-built taxonomy that can jump-start tagging of oil and gas related documents. The taxonomy covers important petroleum and natural gas industry processes, topics, functions, and business areas. 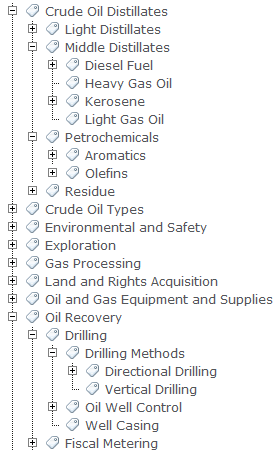 This Oil and Gas Taxonomy can easily be integrated into the term store as managed metadata for a SharePoint 2010 project or in Oracle UCM, Documentum, MarkLogic, or any other application that supports use of taxonomy. If you have an ECM project and you understand how important taxonomy is, using a pre-built foundation taxonomy is always a smart way to get things started. Instead of starting from scratch, start with something that can be customized for your business and that gives your key stakeholders something to touch and feel when they give feedback about what is important to them. 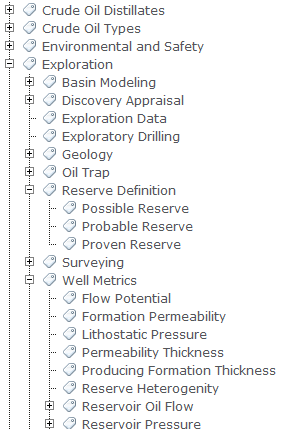 As always, if you'd like to take a look the WAND Oil and Gas Taxonomy or at any of the WAND Taxonomies available, please contact WAND and we can set up a demo. Any information architect, ECM manager, or CIO who is investigating taxonomy for the first time will inevitably reach a decision point: do I buy a taxonomy or do I build a taxonomy? 1) Taxonomy expertise. A finished taxonomy may look simple, but this is because it was developed by somebody trained in the art. Building a taxonomy entirely from a blank slate requires knowledge of taxonomy techniques, and also awareness of the pitfalls that can be encountered. A poorly constructed hierarchy may confuse users more than help them find documents. 2) Time. Taxonomy projects can often take many months with only a few hundred terms to show for it. We've seen a lot of projects get caught up in internal committees and politics. Can you afford for your overall information project to be delayed several months waiting for a taxonomy that everybody agrees upon? Further, there can be a tremendous amount of internal time used in committee meetings. This is a soft cost that can add up very quickly. 3) Taxonomy management software. To construct a taxonomy from scratch, it is wise to invest in a taxonomy management tool. This software will help you create relationships between terms, add synonyms, follow naming conventions, and more. Many companies may just try to maintain a vocabulary in Excel, but that can result in confusion and is not optimal for governance. 4) Cross-Departmental agreement. Starting from scratch has the unique problem that every department, and people within the same departments, may think of the world differently. With no pre-conceived structure for what a taxonomy may look like, team members may all be pulling in separate directions. A pre-built taxonomy provides a common conceptual starting point for everybody. On the other hand, a good pre-built foundation taxonomy can rapidly accelerate the development of your corporate taxonomy and save a lot of headaches and heartaches. By starting with something that gets you 75-80% of the way towards completion, your development efforts can be focused on adding high value terminology, not on setting up the basics. Consulting services can help you get this terminology added, but you will not have to use as many consulting hours as you would if you were starting from scratch. Finally, your information architecture project using taxonomy can be launched months faster than otherwise would have been possible if starting from scratch. By selecting a relevant pre-built foundation taxonomy, supported by a targeted customization project, you can have a high quality, relevant taxonomy much more quickly. The WAND Taxonomy Library Portal gives an organization access to taxonomies covering nearly every industry and functional topic and is a great tool for an organization investing in taxonomy to improve information organization.